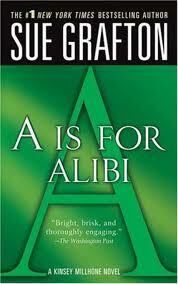 My Series Sunday pick is A is for Alibi, the first book in the Kinsey Millhone alphabet mystery series by Sue Grafton. Private investigator Kinsey Millhone is located in Santa Teresa, California. She is thirty-two years old, twice divorced, no kids, no pets and no houseplants. She lives an uneventful life...until she met client Nikki Fife. Eight years ago, Nikki Fife was tried and convicted of killing her philandering husband. Now Nikki is out on parole and has hired Kinsey to find out who the real killer is. Even though the murder is eight years old, the investigation leads to more suspects and more dead bodies. This is my first book read by author Sue Grafton. I figured I would give her mystery series a try for a few reasons. First, I like series. Second, I love a good cozy mystery. Third, my old faithful mystery series are going downhill and I need new material. And last, I had to check out this alphabet series because it's lasted damn near 30 years. So it must be good, right? "I parked in an expensive lot adjacent to the Westwood Village Mortuary and went into the entranceway near the Wells Fargo Bank, taking the elevator up. The office itself was just to the right as I got off. I pushed through a solid teak door, lettered in brass. The interior was done with polished uneven red-tile flooring, mirrors floor to ceiling, and panels of raw gray wood, hung here and there with clusters of dried corn." Really? Why is all that detail important? It doesn't need to be this wordy unless this is where the crime took place or is essential to the main character solving the mystery. **taking off editor hat and putting reviewer hat back on** Nevertheless, A is for Alibi was good enough for me to read the second book in the Kinsey Millhone alphabet series.